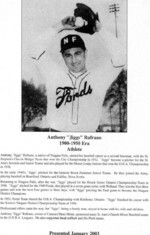 Anthony "Jiggs" Rufrano, a native of Niagara Falls, started his baseball career as a second baseman, with the St. Stephen's Church Midget Team that won the City Championship in 1932. "Jiggs" became a pitcher for the St. Ann's Juvenile and Junior Teams and also played for the Moose Lodge Juniors that won the O.B.A. Championship in 1938. In the early 1940's, "Jiggs" pitched for the General Brock Furniture Senior Teams. He then joined the Army, playing baseball in Brantford, Ontario and Halifax, Nova Scotia. Returning to Niagara Falls, after the war, "Jiggs" played for the Houck Senior Ontario Championship Team in 1946. "Jiggs" pitched for the 1949 Fords, that played in a seven game series with Welland. They lost the first three games and won the next four games in three days, with "Jiggs" pitching the final game to become the Niagara District Champions. In 1952, Fords Team shared the O.B.A. Championship with Kitchener, Ontario. "Jiggs" finished his career with the Kerrio's Niagara District Championship Team of 1956. Professional offers came his way, but "Jiggs", being a family man, stayed at home with his wife and children. Anthony "Jiggs" Rufrano, owner of Cataract Sheet Metal, sponsored many St. Ann's Church Minor Baseball teams in the G.N.B.A. Leagues. He also supported local softball and Slo Pitch teams.